I have a precious friend named Kitty. She sees and hears God EVERYWHERE! Her favorite "mantra," so to speak, is "He is is SO personal!" And that's what I love about Kitty! What are you hearing within...where you and the Holy Spirit live united? What is HE saying to your heart right here, right now? That's where we hear God. Each of those messages could be valid, but which one is He saying to you now...in your inner person? The verbs (action words) in that verse are continuous present tense. 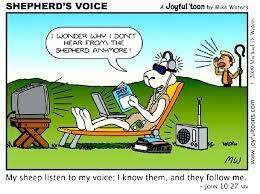 So we could say, "my sheep continually hear my voice, and I always know them and they continue to follow me!" And earlier in John 10, the Lord says his sheep always know the voice of their shepherd. They won't listen to other voices. Where do we hear Him? The answer is, dear friend, we hear Him within...in our spirit, united with His Spirit. That's where the hearing takes place, whether it's through physical words coming from an external source or not. And God very often uses people, events, things (even billboards), whatever He would like to use, to speak to us because He is a Speaking God. And we can count on the fact that we can recognize what HE is saying to us at any given time because we are His sheep. As we seek Him in the Scriptures with our mind and heart, we will hear the Spirit speak. It is He that takes the word of God and speaks it to our hearts and lives. And He can use anything external He wants to do just that. But the hearing is within. There's a Greek word that can help us right here. It's the word rhema meaning word, saying. The common word that we think of when encountering the Scriptures is logos, meaning word in a larger sense. But the word rhema speaks of God's specific message, His highlighted words, so to speak. So we see that our Lord God cares for us enough to speak to us...just what we need for our right here, right now. Isn't that awesome! But remember, there is hearing...and then there is hearing! With the ears of body or the ears of the heart? It may be both or it may just be one, but if it's God, it must be with the ears of the heart! 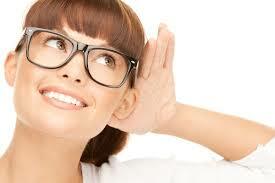 For a more in-depth series, visit Pastor Daniel Hill's blog, Hearing God.